Garden furniture is a little different than regular patio furniture. Most styles of garden furniture are designed to sit on the ground out in the garden rather than up on the deck underneath your patio roof. And when you have furniture that is going to go out in the elements on a consistent basis, you are going to need garden furniture covers to keep your pieces looking sharp. You can just quit asking yourself questions like "Do I really need these covers for my furniture?" because the answer to that is "Yes, of course you do" You already spent good money on the furniture, it isn't going to cost that much more to invest in a set of covers to keep you furniture dollar investment safe from the weather. It's true that you can buy garden furniture made from lightweight materials like PVC, but if you've gone ahead and got yourself a set made from wrought iron or teak, you need to cover them up. The covers are made from a thick gauge vinyl with a polyurethane lining. And this is the important thing to remember, the thicker the gauge of vinyl the more durable the cover. The vinyl exterior of the furniture cover protects your furniture from the rain and the snow. The polyurethane lining is treated to withstand water as well as protecting your garden furniture from nicks and scratches. Sometime you can even find covers with an additional lining of a soft material that will protect your furniture from any scratching that might happen. Some covers are made from woven fabric to allow for airflow. This helps prevent mold and mildew forming on your garden furniture. These kinds usually come with an elastic bottom edge or draw string bottom to hold them in place. When you are getting the covers you might also want to think about how to store your cushions. 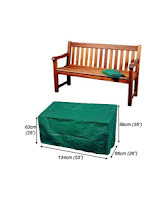 Most online sites that sell garden furniture covers also carry cushion storage bags or boxes, in case you want to store the cushions separate from furniture itself. You can often order these cushion storage units in the same colors or pattern that you got the furniture cover in. With the way the economy is right now, it is the right time to search for and get yourself some great bargains on garden patio furniture and covers. And many websites are bending over backwards to point you toward the really great deals on their sites. No reason why you can't take advantage of their generosity. Thank you so much for this helpful tips. I always wanted to make my garden furniture looks good especially when my family and friends visits me.